Dennis Howard is a native of Lexington Kentucky. He enjoys fishing and worked as a maintenance worker for a steel company in the United States. He is now retired after thirty six years of employment. These records were held by Dennis Howard until they were purchased by the Guelph Public Library Archives in October 2009. Fonds consists of deeds, mortgages, letters, last wills and testaments, and abstracts many associated with Guelph residents including James Goldie. Included are deeds issued by the Canada Company, the City of Guelph, and the James Goldie Company Limited. Other records describe lots or pertain to water levels at the “People’s Mill” in Guelph. There is no further arrangement to these records. A number of records in this collection are fragile and require care in their handling and use. To access these records, consult file list F60, to identify specific files for viewing. Order box 1, Dennis Howard fonds, from the Guelph Public Library Archivist. 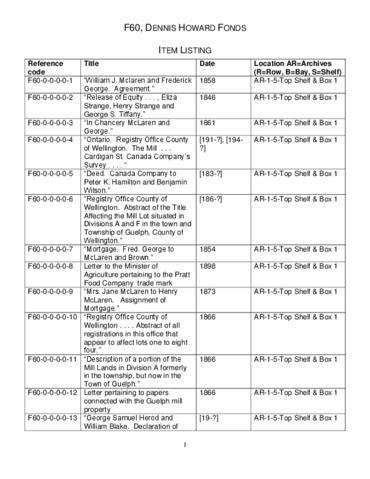 For related records see C21, Guelph Public Library Land Deeds and Mortgages collection.